Windflower Farm whereby we got an surprise assortment of vegetables and fruits every week. This was great because it was fun and cost about the same as what we'd spend at the grocery store if not less. When we moved out of the city (and closer to farms) our options for CSAs changed. We seemed to have more options but the cost of these farm shares tripled and it became obvious that we'd probably be better served to buy a farm and staff it with highly paid farmers rather than opt into one of these shares. So it was that we turned to an infrequent trip to farmer's markets to scratch out pretentious food snob itch. I started off tonight's meal by slicing some thin slice of a yellow carrot and the watermelon radish from the Union Square Greenmarket. 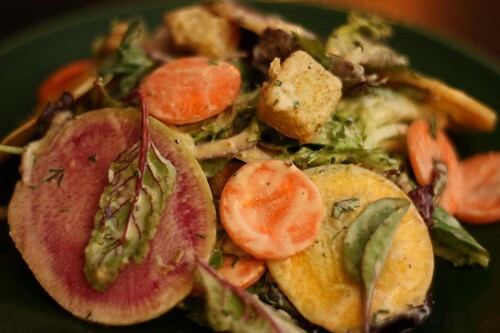 I tossed these together with some mixed greens, thin sliced red onion, croutons, and buttermilk ranch dressing. For the main course I heated a little butter and olive oil in a pan then tossed in some boiled purple majesty potatoes which I'd sliced into thick chunks. I would have toasted some garlic except, much to my dismay, we appeared to be completely out. In lieu of garlic I threw in some finely diced red onion then wilted some baby spinach. We bought the purple majesty potatoes mostly because of their name and because we felt it made us patriotic. 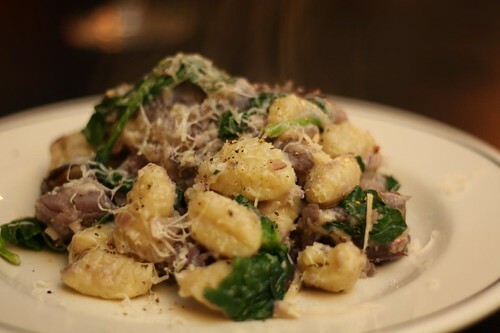 Finally I tossed in cooked some gnocchi and tossed it all together with a little shredded Gruyere over the top. 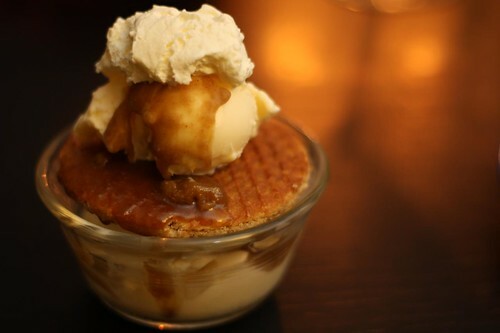 For dessert I put together these lazy sundaes out of some vanilla ice cream, leftover bourbon caramel sauce, and stroopwafels. It's Friday night but we didn't feel like getting really drunk then taking a prostitute to dinner in the city so instead we did the next best thing and watched Arthur. ARTHUR IS MY FAVORITE MOVIE AND I AM REALLY GLAD YOU GUYS ARE WATCHING IT. It's a pretty great movie.